Over 100 natural media brushes designed to give your Procreate paintings a richly textured, traditional feel. Energetic bold marks, thick chunky paint, and warm texture are just a brushstroke away. Scratchy bristles, toothy pencils, and sharp inkers mean you’ve always got detail where you need it. Intuitive and predictable pressure and tilt behavior make MaxPacks brushes the perfect tool for everyone, from hobbyists to working professionals. Enjoy 75 comics-focused brushes designed to give your illustrations energy and character. They're perfect for creators of sharp web comics, grungy graphic novels, stylish editorial illustrations, elegant calligraphy, and anyone who needs subtle, rich linework. Highlights include the Sable Inkers, premium ink brushes with subtle texture perfect for the most sensitive linework. The Toothy Inkers are bold and gritty, with tilt action giving you a rough halftone just where you need it without having to switch brushes. If it's precision you're looking for, the Fountain Pens and Tech Pens have you covered. The Leaky Inker and Blobby Pen are perfect for retro mid-century pieces and cartoon modern flair. For calligraphers and adventurous illustrators, the Parallel Pens create dynamic thick and thin marks and realistic drying effects with tilt. They're the ideal complement to the scratchy texture of the Rake Brushes. 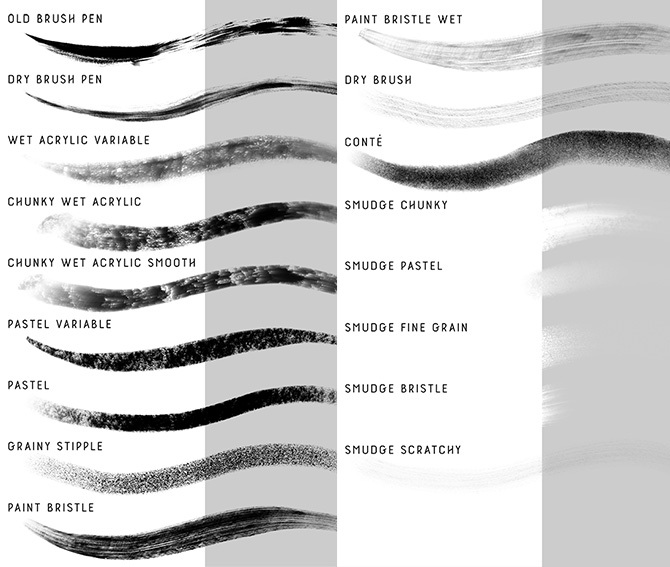 The Charcoal Brushes can be used to add texture and value to any piece, or on their own to create loose, fun images. When it's time to add color, the Markers are an instant classic. They layer just like the real thing. Then finish it all off with a waxy Colored Pencil that blends just the way you're used to. Most brushes are capable of a wide range of marks and feature unique dry brush effects when tilting with the Apple Pencil. 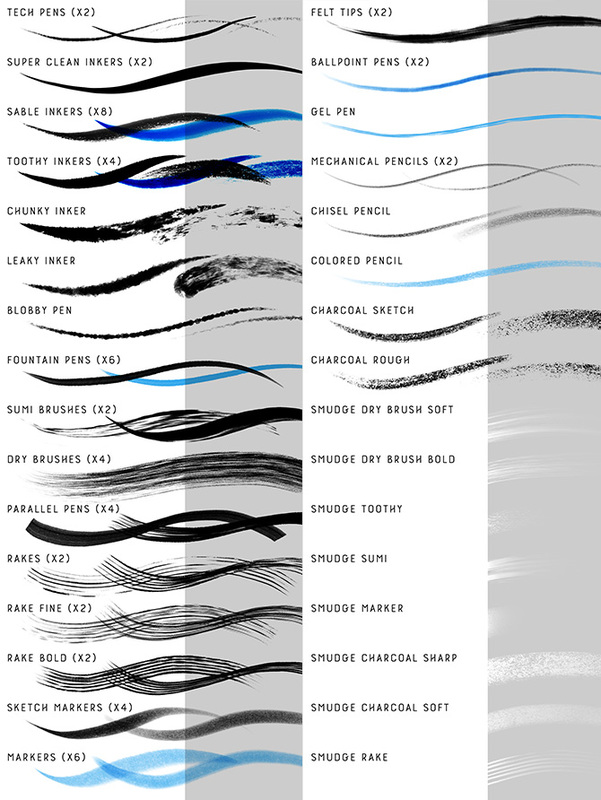 Many of the ink brushes and markers include valuable variants like multiply blend modes that mix colors just the way you'd expect with real ink. And don't forget, you're not limited to linework with ink brushes, you can paint with them too! No matter the effect you're looking to create, this is the pack you need. Enjoy 12 natural media brushes and 5 bonus smudge brushes designed to give your digital paintings a richly textured traditional feel. I'm very fond of the Chunky Wet Acrylic brushes, which can be used for broad, rough, painterly strokes, or for fine details. They blend like a dream when you lift off the pressure, or they can leave thick bold marks if you're looking to make a statement. Also featured in the pack are my favorite Old and Dry Brush Pen variants which can be used for lovely sumi style inking or as a bristly paint brush. Many brushes feature tilt effects when used with the Apple Pencil, most notably scratchy bristles like you would find in a real brush pen, and realistic conté side shading. This set is perfect for artists who want to loosen up and get a little messy and painterly!